The Voicelessness and Emotional Survival website was created by Dr. Richard Grossman to help people who have been deprived of “voice” by narcissistic spouses/partners, boyfriends/girlfriends, parents, siblings, adult children, bosses and co-workers. The website includes essays on narcissism and its damaging effects and a message board for people to share their experiences with voicelessness and help others deal with the aloneness that results from having one’s voice taken away. 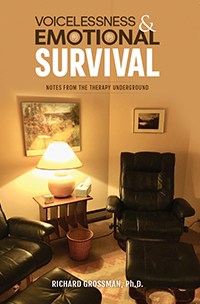 Dr. Grossman’s new book, Voicelessness and Emotional Survival—Notes from the Therapy Underground describes the surprising voicelessness he experienced in the professional psychology/psychiatry world, what he learned from it, and the resultant therapy he developed in order to help other people deprived of voice free themselves from destructive relationships.